We are thrilled to be returning to Montana as it is one of our favorite places. 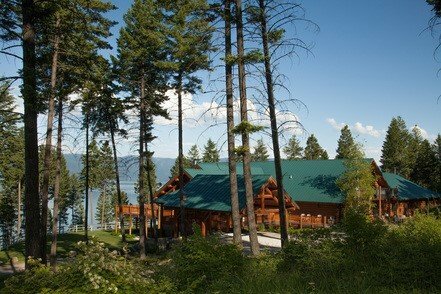 Located on beautiful Flathead Lake, the natural surroundings provide spiritual beauty as you are inspired to create your art while enriching your soul. A special place that is hard to leave, the beauty is beyond spectacular. We’ll stay in a very special log building overlooking the lake, a 60-mile long 30-mile wide remnant of the ancient, massive glacial dammed Lake Missoula. With the peaks of Glacier Park in the background, this retreat will fill you with laughter, creativity, friendship and fun! Sign up early as our retreats fill quickly. To make it easy to budget, we offer an installment plan, at no extra charge, that begins January 2019 and ends in June 2019. The cost is $779 and includes meals, hiking trails, outings to local quilt shops, professional quilting instructions, games, and of course the week-long class. We will have a planning meeting in April with all lucky participating quilters to talk about travel plans and all the details.